Jeff and I slept a little late today, but we were looking forward to our first whole day in Sydney. 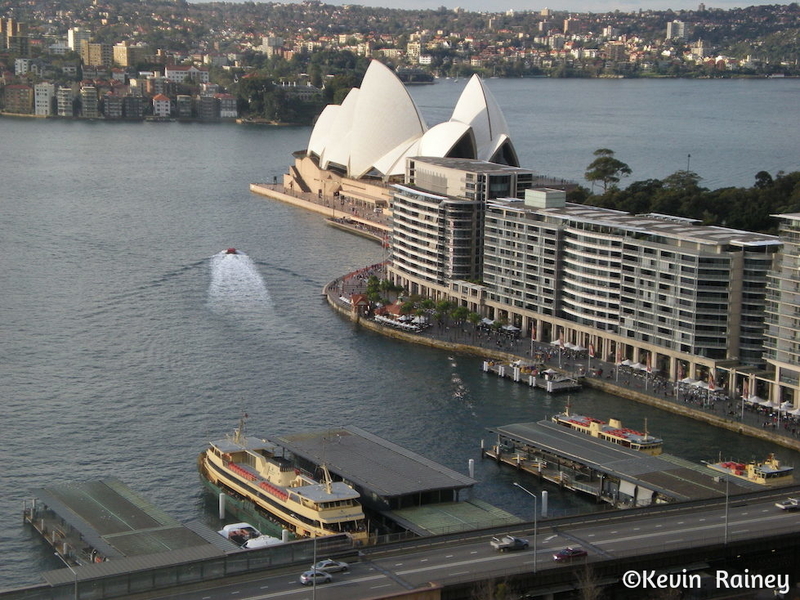 Outside our window, Sydney Harbour looked marvelous on a cool summer day. We walked down to the Sydney Opera House and had sandwiches for lunch at the Theatre Bar. Then we went on our 12:30 p.m. tour of the Sydney Opera House. Contrary to its singular name, the Sydney Opera House is a multi-venue performing arts venue. Situated on Bennelong Point in Sydney Harbour between Sydney and Farm Coves, it sits adjacent to the Sydney central business district and the Royal Botanic Gardens. It’s famous as much for its design as its dramatic location. Danish architect Jørn Utzon designed the Opera House which was built in 1973. It is both a UNESCO World Heritage Site and icon of the nation. The modern expressionist design features a series of large precast concrete “shells” – each composed of sections of a sphere of 247 feet in radius – forming the roofs of the structure, set on a monumental podium. Though the shells appear uniformly white from a distance, they actually feature a subtle chevron pattern composed of more than 1 million tiles in two colours: glossy white and matte cream! Apart from the tile of the shells and the glass curtain walls of the foyer spaces, the building’s exterior is largely clad with aggregate panels composed of pink granite quarried at Tarana. The building is supported on 588 concrete piers sunk as deep as 82 feet below sea level. As we began the tour, our guide explained the interior materials. The builders used an interesting mix of off-form concrete, Australian white birch plywood and brush box glulam. We first visited the Concert Hall, the largest venue. With almost 2,700 seats, the Concert Hall hosts the Sydney Symphony Orchestra and contains the Sydney Opera House Grand Organ. The organ is the largest mechanical tracker action organ in the world, with more than 10,000 pipes. We also toured the Opera Theatre, a proscenium theatre with more than 1,500 seats. It hosts Opera Australia and The Australian Ballet. We also saw the smaller Drama Theatre, a proscenium theatre with 544 seats, used by the Sydney Theatre Company. We passed by another venue called The Playhouse, an end-stage theatre in the basement with about 400 seats. Lastly we saw The Studio, a flexible space with a maximum capacity of 400 seats. The tour was really interesting and we decided we had to come back and see something that evening. Although I like classical music, neither one of us are huge opera fans and the tickets were astronomical. We decided to buy tickets to a cheaper show in The Playhouse that evening. After visiting the Opera House, we walked west near the harbor front to Sydney Olympic Park. We saw a few of the venues where the 2000 Summer Olympics were hosted. Afterwards, we walked to Hyde Park, Sydney’s most beautiful park in the city center. It is named after central London’s Hyde Park. 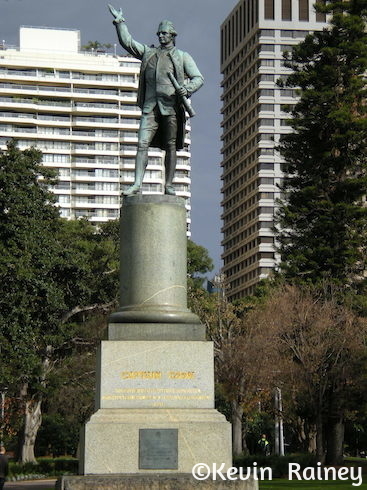 We saw the statue of the great British explorer, Captain James Cook. At the southern end of the park, we visited the Anzac Memorial, one of the top monuments in the city. The ANZAC War Memorial became the main military monument for the city when it was completed in 1934. It commemorates Australian Imperial Forces who died in World War I. ANZAC refers to Australian and New Zealand Army Corps (ANZAC). Resting on a cruciform pedestal, the concrete building consists of a square structure with Art Deco setbacks and buttresses, accented on the side by a large arched window of yellow stained glass, and topped by a ziggurat-inspired stepped roof. Several bronze murals, granite relief panels and 20 stone sculptures of military figures adorn the outside. The white marble interior features a domed ceiling adorned with 120,000 gold stars – one for each of New South Wales’ military volunteers during World War I. After enjoying the peaceful park and admiring the reflective pool in front of the ANZAC War Memorial, we visited the St. Mary’s Cathedral, home of the Roman Catholic Archdiocese of Sydney. St Mary’s is the longest church in Australia. Later that evening, we toured the Australian Museum – the oldest museum in Australia, with an international reputation in the fields of natural history and anthropology. The museum dates back to 1836. We saw a great exhibit on dinosaurs and paleontology. We couldn’t believe how big some of these T-Rexs were. We also enjoyed some of the zoological and anthropological exhibits. Lastly, we enjoyed the Aboriginal exhibits and artwork learning more about the history of the Aboriginal peoples of Australia. 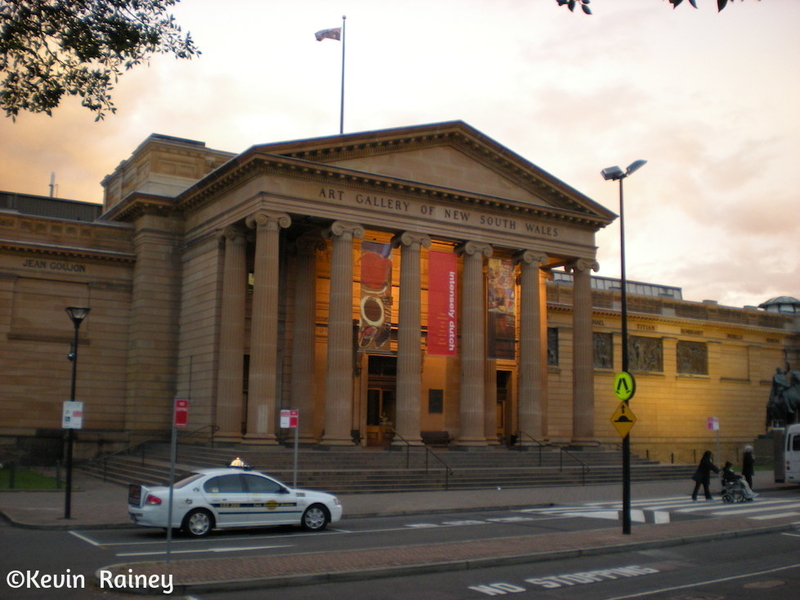 We then walked past the Gallery of New South Wales towards Sydney Harbor. We watched what might have been the best sunset I have ever seen at a point called Mrs. Macquarie’s Chair, named after the former governor’s wife who had a chair there to longingly watch the ships coming from England. The point, at the end of the Royal Botanical Gardens, provides one of the best viewpoints of both the Opera House and Harbor Bridge. We watched the sun reflect of the white shells of the Opera House as it sank behind the west bay and Harbor Bridge. After the sunset, we walked down to the Opera House and ate dinner at the Sidewalk Café/Bar Lower Concourse overlooking Circular Quay and the Harbor Bridge. I had a surf and turf with the most amazing filet mignon and shrimp. It was expensive but you could not beat the views! To top off the evening, we went to see “Holy Cow 2” at 7 p.m. in The Studio – located in the Opera House’s basement. Tickets were about $30 and we enjoyed the show by the comedic Dutch magicians from Amsterdam. It was hilarious with a lot of audience participation. We finished the evening by walking by the harbor back to the Marriott. We grabbed some tasty chocolate gelato at Circular Quay as we walked back to the hotel. A fantastic day in one of the world’s great cities!